If you’re flying in and out of the Chubu Centrair International Airport and you’re taking the µ-Sky Airport Rapid Limited Express train to get out or get in the airport, you might as well make Meitetsu Department Store your first and last stop. 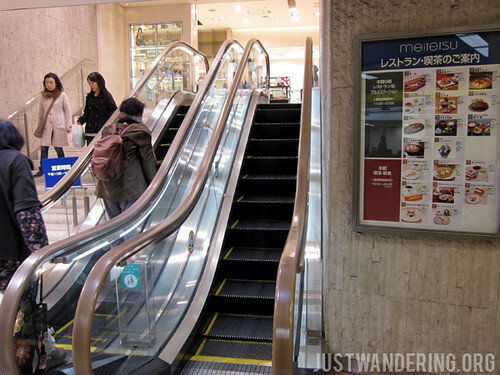 Connected to the Meitetsu-Nagoya Station, the department store entrance is just a few steps away from the turnstiles. The Meitetsu Department Store has two buildings: the main building with over 10 floors of retail, and the 6-storey Men’s building. If you’re transiting, head to the basement where you can buy bento boxes (at a discount, if you’re buying near closing time), groceries, and edible souvenir items to take home. Do you have extra time to kill? You can head up to the 9th floor Gourmet Station, where you can enjoy yummy Japanese and some Western cuisine from 11 am to 11 pm. Of course, there’s the shopping. Meitetsu Department Store feature several international brands like Louis Vuitton, Burberry, Armani, Marc Jacobs, Anna Sui, and Jill Stuart. Foreign tourists who entered Japan within the past 6 months are eligible for a tax-refund for purchases of more than ¥10,001 made in the store on the same day. Just head over to the Duty Free counter on the sixth floor of the Main Building and bring your passport, purchased products, and receipts of your purchases. 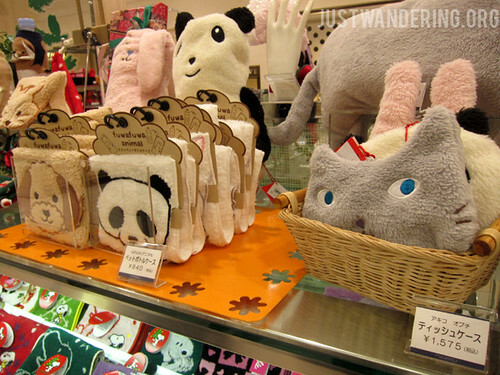 A lot of cute stuff I resisted. Language barrier can be a bit of a problem in Japan, but not to worry, as Meitetsu Department Store have interpreters that can help. If you need help, just approach a sales staff and they can help patch you with the interpreter. The department store also provide other customer services like porter and cloakroom for your purchased items, coin-operated lockers, wheelchair rental, stroller rental, infant rest area and nursing room. Got a shoe emergency? Shoe repair services are available in the B2 and 3rd floor of the Main Building, and on the 1st floor of the Men’s building. The Meitetsu Department Store connects you not just with the airport, but with the trains in the Nagoya Railroad (Meitetsu) system. There is also the Meitetsu Bus Center on the 3rd and 4th floors, where you can board buses to go to Shin-hotaka, Gujo City, Takayama, Matsumoto, and Nagano.